Born in 1950, forming his first band at the age of 13, Steve Ellis has spent the past 40 years fronting bands whilst singing lead vocal. He has performed with Love Affair, Widowmaker and Ellis, three bands that achieved commercial and critical acclaim. Indebted to the soul singers he grew up with, Steve has continued playing live or with his version of Love Affair or playing at benefit gigs such as the recent Steve Marriott tribute concert. 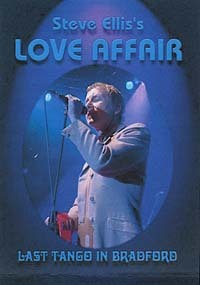 This DVD includes all the Love Affair ‘hits’ plus a few soul classics thrown in for good measure. Danny Fox stars on guitar while Ellis himself rolls back the years…Definitely one for the 'older' classic rocker.